It means an end to cumbersome reimbursement and reconciliation procedures. Card accounts can be set with approved limits or restrictions. Fares appear in real-time on a secure, Web-based application. 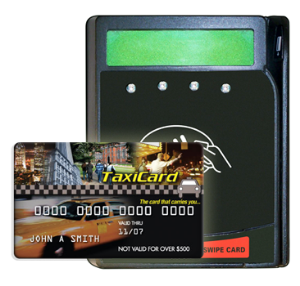 Use TaxiCard in conjunction with our DriverCard solution to electronically pay drivers, manage expenses and access funds. Finally, making payments, tracking, and reporting in a single solution! Call (866) 664-1277 or Contact Us to strengthen your existing service. Remove vouchers, scrip, and coupons from government and corporate programs. Electronically track and capture trips with cards that work like a credit or gift card. Use a prepaid, tracking, or reusable stored-value card. Improve your operation using high-speed transaction processing and credit card processing. Automate trip verification, reporting, and auditing for government and corporate programs. Increase sales and customer loyalty. Reduce cash transactions and improve driver and customer safety. Either we can adapt to your existing readers, hardware, and software, or we can find you another more economical solution. Perfect for students, seniors, business travelers, and people on the go, TaxiCard Discover® Network Prepaid Card offers riders the benefits of a gift card. TaxiCards® can be accepted by any taxi, sedan or limousine service that accepts Discover Network cards. And you can add value to your card online, over the phone or in the mail.